The Nabonidus Cylinder which names Šagarakti-Šuriaš as builder of the Eulmaš temple. 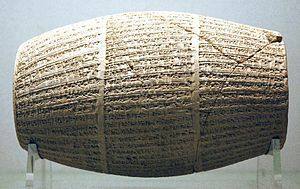 The Babylonian King List A names Kudur-Enlil as his father but there are no confirmatory contemporary inscriptions and the reigns are too short around this period to allow for the genealogy alleged by this king list. He is featured in a letter written in later times between the Assyrian king Tukulti-Ninurta I and the Hittite king, possibly Suppiluliuma II. Unfortunately the text is not well preserved, but the phrase “non-son of Kudur-Enlil” is apparently used to describe him, in a passage discussing the genealogy of the Kassite monarchy. More than three hundred economic texts have been found in several caches from Ur, Dur-Kurigalzu, and overwhelmingly Nippur dated to Šagarakti-Šuriaš’ reign. In addition, there are 127 tablets recently published probably recovered from Dūr-Enlilē. They are characterized by the extraordinary variety of spellings used to name this king, who bears a defiantly Kassite title in contrast with his predecessor. Brinkman identifies eighty four permutations, but disputes the suggestion by others that Ātanaḫ-Šamaš was a Babylonianized equivalent adopted to overcome the linguistic problems of the natives. The texts record events such as the hire of slaves, payments in butter to temple servants, and even an agreement to assume a debt for which a priest had been imprisoned. Amīl-Marduk was the Šandabakku or governor of Nippur during his reign, a position he had filled since the earlier reign of Kudur-Enlil. It has been suggested that the preponderance of commercial texts detailing debts, loans and slave transactions indicate that Babylonia faced hard economic times during his reign, where people sold themselves into slavery to repay their creditors. One of which[i 2] seems to indicate his involvement in the incarceration of an individual while another[i 3] is a declaration of zakût nippurēti, "freeing of the women of Nippur" as part of a general amnesty. Ini-Tešub, the king of Kargamiš, wrote a letter to him complaining about the activities of the Ahlamu and their effect on communications and presumably trade. I excavated, surveyed, and inspected the old foundations of Eulmaš, (Anunitu’s) temple which is in Sippar-Anunitu, which for eight hundred years, since the time of Šagarakti-Šuriaš, king of Babylon, son of Kudur-Enlil, and on the foundation deposit of Šagarakti-Šuriaš, son of Kudur Enlil, I cleared its foundations and laid its brickwork. —Inscription of Nabonidus, cylinder BM 91124, in the British Museum. Šhagarakti-šuriaš, a faithful shepherd, a revered prince, favorite of Šamaš and Anunit - am I. When Šamaš and Anunit, for lordship of the Land mentioned a name, they filled my hands with the leading string of all peoples. At that time Ebarra the temple of Šamaš of Sippar, my lord, and Eulmaš temple of Anunit of Sippar-Anunit, my lady, whose walls since the time of Zabum because of old age had sagged - their walls I demolished. Of their ruined foundations - I took away their earth. Their shrine(s) I preserved. Their plans I retained perfect. I filled in their foundations with earth; the supporting wall(s) I restored. Their walls in their places I embellished. Their appearance I rendered more excellent than before. Forever, O Šamaš and Anunit, because of my precious deeds may your hearts be glad. May they lengthen my days. May they renew (my) life. Days of joy, month(s) of happiness, years of prosperity may they grant (me) as a gift. A judgment of precision and justice may I speak, and may they cause peace to be always. —Inscription of Nabonidus, cylinder BM 104738, column III, lines 44 to 62. A clay tablet from the time of Sennacherib (705–681 BC) quotes a legendary inscription from a lapis lazuli seal. Originally the seal was in the possession of Shagarakti-Shuriash, but was carried off to Nineveh by Tukulti-Ninurta I (1243–1207 BC) as war booty when he sacked Babylon during Kaštiliašu’s reign, and he had his own inscription engraved on it without erasing the original. Sometime afterwards the seal again found its way back to Babylon, in circumstances unknown, where it was re-plundered, some six hundred years later by Sennacherib. A brick discovered in situ in Nippur has an inscription along its edge which shows that Šagarakti-Šuriaš commissioned work here on the Ekur of Enlil as well. ↑ Babylonian King List A, BM 33332, a broken and badly worn tablet in the British Museum, provides his name in abbreviated form, Šá-ga-rak-[ti-], and the length of his reign. ↑ 1.0 1.1 1.2 J. A. Brinkman (1976). "Šagarakti-Šuriaš". Materials for the Study of Kassite History, Vol. I (MSKH I). Oriental Institute of the University of Chicago. pp. 287, 305–310. ↑ 2.0 2.1 Itamar Singer (2006). "KBo 28.61-64, and the struggle over the throne of Babylon". Ḫattuša-Boğazköy. Gernot Wilhelm. pp. 223–245. ↑ Wilfred van Soldt (2015). 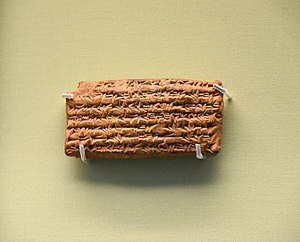 Middle Babylonian Texts in the Cornell University Collections: I. The Later Kings (CUSAS 30). CDL Press. p. 23. ↑ J. A. Brinkman. "Ātanaḫ-Šamaš". MSKH I. pp. 323–324. ↑ Albert T. Clay (1906). Documents from the Temple Archives of Nippur dated in the Reigns of the Cassite Rulers. Departmenf of Archaeology, University of Pennsylvania. pp. 71–72. CBM 3341, 3519, 12908. ↑ Stephen Bertman (2003). Handbook to Life in Ancient Mesopotamia. Oxford University Press. p. 102. ↑ Jonathan S. Tenney (2011). Life at the Bottom of Babylonian Society. Brill. p. 120. ↑ J. A. Brinkman (2006). "Babylonian Royal Land Grants, Memorials of Financial Interest, and Invocation of the Divine". Journal of the Economic and Social History of the Orient. 49 (2): 42. JSTOR 25165127. note 187. ↑ George R. Law (2010). Identification of Darius the Mede. Ready Scribe Press. p. 207. ↑ S. Langdon (Jan 1916). "New Inscriptions of Nabuna'id". The American Journal of Semitic Languages and Literatures. 32 (2): 115. doi:10.1086/369788. JSTOR 52834. ↑ L. W. King (1904). Records of the reign of Tukulti-Ninib I, King of Assyria, about B.C. 1275. Luzac and Co. pp. 66–69. ↑ Hermann Vollrat Hilprecht (1903). Explorations in Bible lands during the 19th century. A. J. Hollman & Company. p. 472.